When you find something you really want to explore, then you can explore it like the portfolio to the left. Note that this portfolio contains twelve new pictures, but a concentration portfolio could also contain close-ups, sketches and process images. Because of this, it is important to take pictures of your process while you are doing your concentration work; every step counts, particularly if you change directions. Exploration is key, and there is no exploration without hitting walls and trying something new. You can also opt to submit twelve complete and beautiful images such as the ones to the left. 8 complete images plus four process images. The drawing portfolio above scored a 6 out of 6. READ the judges' rationale below. This will help you see what they are looking for. 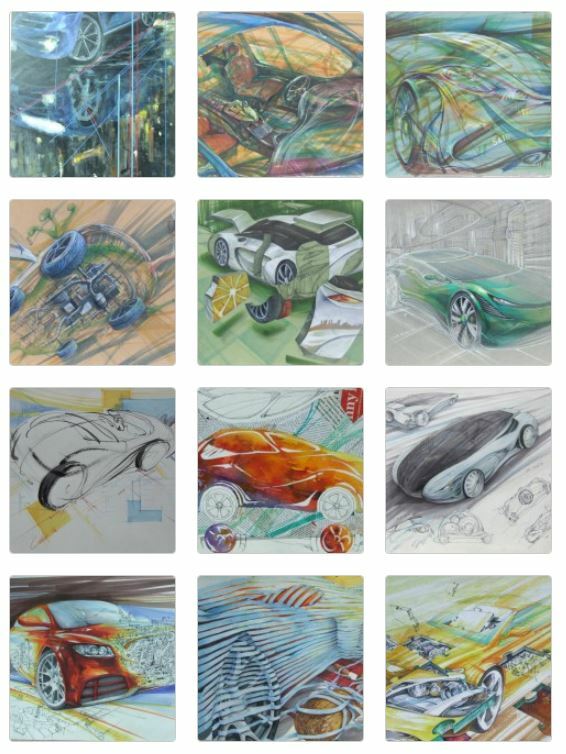 • This excellent investigation of automotive designs illustrates effective conceptual and visual decision-making using diverse solutions that are convincingly coherent. • The images demonstrate thorough understanding and innovative use of 2-D design principles. For example, color and line are employed effectively to describe motion and implied form in images 11 and 12. Rhythmic figure-ground relationships also contribute to dynamic compositions. • Sophisticated technical skills abound in the seamless integration of mediums. • Personal vision and student voice are prominent throughout the body of works. Conceptual and visual solutions are documented simultaneously in images 7, 9 and 10.